Needless to say 50 was NOT impressed. These two young men are showing MATURITY. It also symbolizes the next gen thinking different. Ni66as have to figure out how to prosper collectively & put the ego aside for the betterment of their FAMILY. Supreme locked down for life & Curtis is estranged bcuz his 1st born has the instinct to protect his mom. Rhymes With Snitch you all are liars...This pic shows two mature young men who are far more mature than their fathers. Stop instigating and lying, and celebrate their maturity and forgiveness. Get the f*ck outta here. LMAO he is his father's son. 50 you inspired this, reap what you sow. 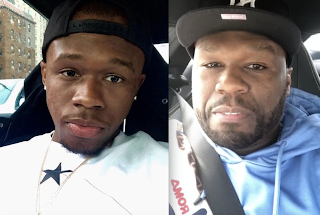 Not only does he look just like 50, he's also just as petty lmao. Love it. What sane man would state that if his kid got hit by a bus he wouldn't be destroyed? The son is more mature than the Dad. That shows how he was raised -- by his Mom and her family. Who raised 50? I hope BOTH of these young men have genuine intentions for friendship & NOT ulterior motives. 50 needs to take his fingers out of his pu*sy & stop reacting like a broken hearted girl. 50 lives up to his Power character, huh? Sad. All 50 should've said was...nothing. He should've let his silence speak. Teens/children say & do A LOT of extremely disrespectful things to their parents. BUT as a parent YOUR words can hurt the kid waaaaaay more. 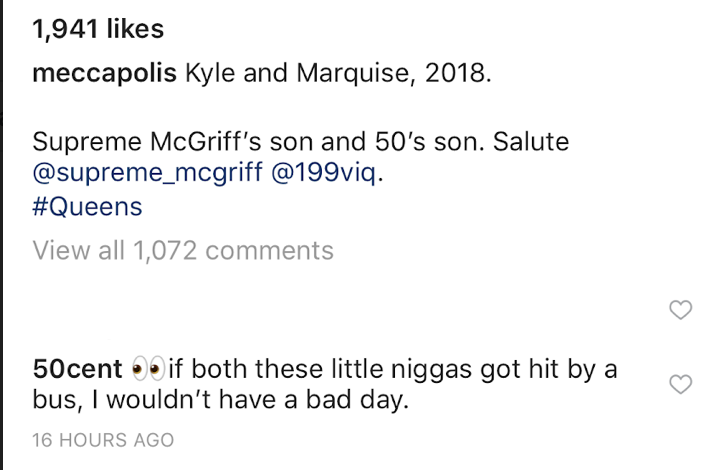 I can't believe 50's response on his own child. 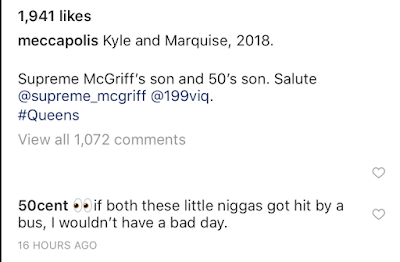 I mean it's not hard to see why Marquise would pose with the boy plus I agree perhaps they are not making and old beef their beef and if 50 was loyal to his own son perhaps he would receive that loyalty back. Hey, Anons 9:18AM and 9:24AM, f ck ng idiots. Showing maturity is not taking a pic with the son of the man who nearly killed your father and possibly had a hand in murdering your grandmother (both of which Supreme denied, but he'd be a fool to admit it anyway). Maturity is taking the pic and NOT posting it on IG/Twitter, if it's genuine. 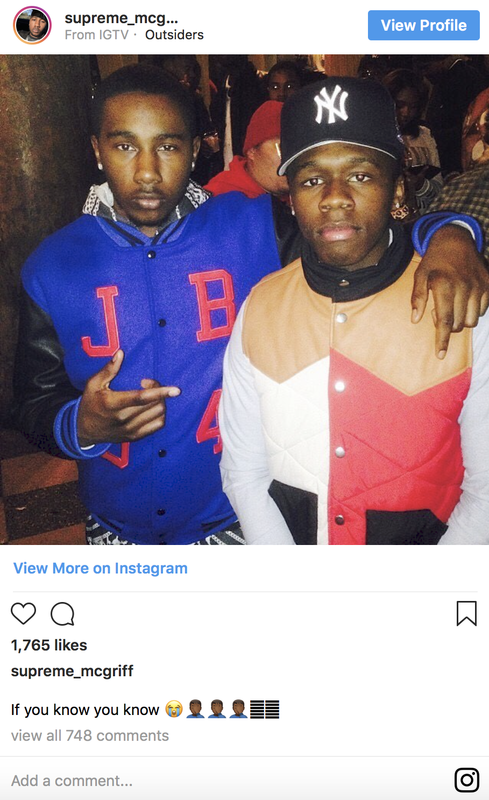 MAYBE Marquise gets a pass for taking the pic because TMZ reported "Marquise didn't know the full backstory when he took the photo with him." I don't usually name call unless you're a f ck ng idiot. So hold that.